Here we compiled our top 11 most frequently asked requests! Q: How much experience do your specialists have? A: Our Travel Specialists are Peruvian with extensive experience working with international clients, foodies, and professional chefs so they will understand your customs, beliefs and cultural backgrounds. We have been in the business of planning successful culinary tours in Peru for many years now and we take that very seriously (and have fun doing it). Q: How can I get in touch with your Travel Specialists? A: Please call us at 703-822-5312 and ask for Ana Maria or Veronica or send us an email at reservations@taste-of-peru.com. Our Travel Specialist will be in touch in 24 hours to start working on your culinary program, fully customized on the basis of your needs and requirements. Q: Why book a culinary tour with Taste of Peru? A: Taste of Peru offers a full-service approach which has one goal in mind – to make you learn Peruvian culinary culture and enjoy tasty and top quality food. Our culinary tours are different from typical ones, and therefore require the planning of an experienced travel agent. We constantly create new classes and culinary activities for our clients, since this sector is in fast development and we are always up to date with new restaurants openings, new ingredients and culinary trends. Q: Why shouldn’t I just do it all on my own? A: We have many years of experience organizing unique culinary tours and activities in Peru and this helped us building a solid and extensive network in the country and abroad. We can provide any kind of cooking class with the most recognized Peruvian Chefs, as well as a wide range of culinary activities and fit them in your own program and schedule. Please note that our tours are highly customized to your needs and goals and we provide the best service in the market. A: Our teachers are famous and well-recognized Peruvian Chefs who mostly own their own restaurants in Lima, Cuzco and around the world. They are Chefs with several years of experience and in some case internationally awarded. As soon as you confirm your program with us we will let you know who will be your teacher, his/her profile and expertise. Q: I am a professional Chef. Can you prepare a special program for me? A: Yes, of course we can. We runs programs on a daily basis for any kind of people, from people eager to learn a bit more on Peruvian culinary culture to professional Executive Chefs all over the world. Our programs are fully customized and we can certainly adjust them to participants’ level and requirements. They include an extensive culinary curriculums (traditional Peruvian cuisine, Nikkei cuisine, Andean cuisine, and more) and can be used for continue education program. We are also able to provide certificates signed by the Chef in charge of the class. Please note that we are able to organize many different activities and programs that is why we can work with a broad target. Q: I am a vegetarian. Can you prepare a special program for me? A: Yes, of course we can. As vegetarian you can live an amazing culinary experience in Peru as well and we can offer you many different special options and activities that will allow you to learn more about Peruvian culinary culture and enjoy the best veggie food in the country. Q: I am a student. Can you prepare a special program for me? A: Yes, of course we can. We can prepare special programs reflecting students’ needs and requirements. We know that most of the time students have a limited budget, and we are able to offer a fully customized program for you, that will allow you to learn more about Peruvian culinary culture with our extensive and constantly updated list of culinary curriculums. We can also provide certificates signed by the Chef in charge of the class. Q: Can you organize group tours? A: No, all our culinary programs and activities are in private, but we certainly recommend you a group tour run by one of our trusted partners in Peru. Q: Do you run culinary programs and activities every day? A: Yes, we do. We run culinary programs and activities on a daily basis, so that you can chose the best time for you and you will live the best culinary experience in the country at your convenience. Q: Do you get the best prices for travel packages? A: All of our packages have competitive pricing and will always include best value services for each level you choose. Even when booking hostels, we will only include the ones we recommend. It is sometimes difficult to explain why one operator is more or less expensive than another. 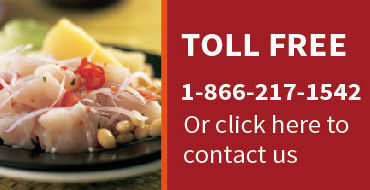 Taste of Peru is not one of the cheap operators in Peru. Our focus on service and the quality of our local partners limits our ability to reduce our costs to the minimum as many of other operators do. We have determined that it is better not to cut corners in order to assure that our clients are well taken care of during their stay in Peru. We are unequaled in offering services such as a 24-hour, in-house emergency assistance hotline.